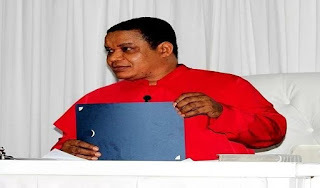 The spiritual leader of the Brotherhood of the Cross and Star, Olumba Olumba Obu, yesterday, assured Nigerians that President Muhammadu Buhari will soon return home hale and hearty. Four months ago, Olumba Olumba had said that Buhari would not die in office, saying he would accomplish his tenure if he worked as a father of the nation, accommodating all sections and interests of all Nigerians. He called on all branches of his organisation in Nigeria and beyond to embark on what he called ‘outing-and sing and pray for the president’.